38th Annual Village Venture Arts and Crafts Faire Vendor Applications will be available on Wednesday, May 1, 2019. 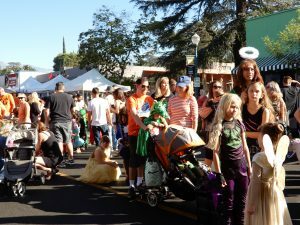 The Claremont Chamber of Commerce is excited to present the 38th Annual Village Venture Arts and Crafts Faire located in the Claremont Village on Saturday, October 26, 2019, from 9 a.m. to 5 p.m. Rain or Shine. The Claremont Village is located in downtown Claremont off of Indian Hill Blvd. between First and Fourth Streets. Get your holiday shopping done early as you walk the streets of the Claremont Village lined with over 400+ booths selling unique art, original crafts, and apparel. Get to know all the local businesses and non-profits in the business and organization block located on First Street. Be sure to also stop by the food court for an array of international foods and entertainment. 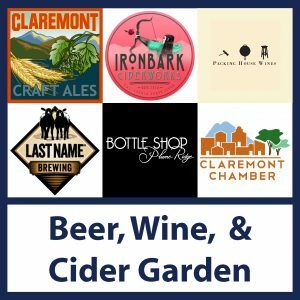 Returning this year is our Beer, Wine, & Cider Garden located on Bonita Ave which will be serving local Craft Ales, Wine, and Cider from 11 am to 4 pm. Don’t forget to stop by the village businesses on both sides of Indian Hill that will be open all day. This is the place to kick off your one-stop holiday shopping; you’ll find something unique for everyone on your list! Sit and relax at one of our sidewalk cafes, or enjoy the international cuisine located on First Street. Well over 15,000 visitors attend Village Venture every year to enjoy not only this one-day event but also the wonderful shops and restaurants that are located in our city. - Take your pre-carved pumpkin to the Sunrise Rotary Booth (located on Yale Ave. just north of 2nd by the Chamber office) between 8:30 a.m. and 9:30 a.m.
- Complete the Registration Form when you drop off your pre-carved pumpkin. - Prizes will be awarded at 2 p.m. (participants must be present to win). - Pumpkins must be picked up between 2 - 4:30 p.m.
Starts at Bonita & 4th St.
- New location and time for the Children's Halloween Parade. The Parade will begin at promptly at 9:30 am on Saturday, October 26. - All participants must assemble at the corner of Bonita and Harvard by 9:00 a.m.
- Parade will be led by the El Roble Marching Band. Booths located on First St. between Yale Ave. and Harvard Ave.
We allow dogs, but not in the food court area! Please make sure you clean after your dogs!!! Beginning at 8:30 a.m. to 5 p.m.
Ambrose Episcopal Church: Bonita and Mountain Ave. Located at Bank of America Parking Lot - Enter off Indian Hill Blvd. If you have questions about attending our event, please contact the Claremont Chamber office by calling (909) 624-1681 or by email: admin@claremontchamber.org.